Below is a list of my fifty favorite home video releases of 2010 – the top ten in preferential order and a 40-way tie(!) for number eleven. The only titles below that I didn’t actually purchase were the Von Sternberg, Costa and Gaumont box sets, which I rented instead, and that was mainly due to my fear that they will become available in better quality Blu-ray editions in the near future. In making the list, I arrived at my rankings by averaging my estimation of the quality of the movie as a whole, the image/sound transfer and the supplemental material. I also decided to spread the love around a little by including only one film per distributor in my top ten. Criterion and Masters of Cinema would have otherwise locked up most of those slots and I believe that a lot of other distribution companies deserve recognition for the brilliant work they’ve done. As this list should make clear, we are living in a true golden age of home video where the history of world cinema is readily available in breathtaking quality as it never has been before (at least for anyone with a multi-region Blu-ray player). This disc isn’t perfect. For one thing, the image is interlaced instead of progressive scan. But this is such a quantum leap over the old non-anamorphic DVDs in every other area (clarity, color, depth and contrast), that I was still ecstatic to see it. The film itself, a delicate love story about teenage country bumpkins who move to Taipei in search of greater opportunity in the 1960s, remains one of Hou Hsiao-Hsien’s best early works, paving the way for the opening segment of his masterpiece Three Times. I had previously thought of the cinematography in this movie as merely functional. Sony’s Blu-ray proves that it’s actually very beautiful. I can’t wait for more HHH in HD! Universal haven’t gotten things 100% right when it comes to Blu-ray. They haven’t been as meticulous about image quality as, say, Warner Brothers (see last year’s perfect North By Northwest disc for comparison), and I find their generic menus especially annoying. 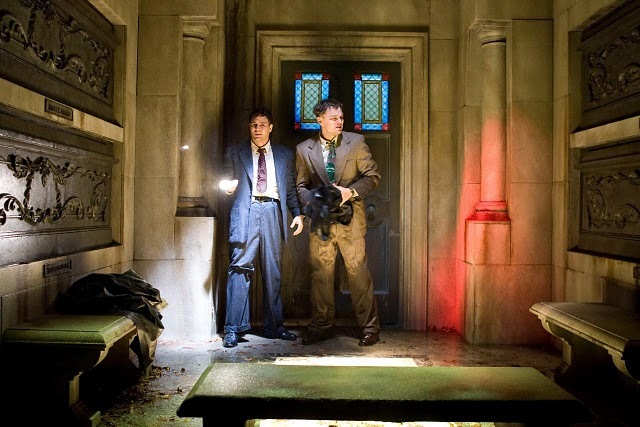 But I did enjoy Psycho‘s subtle but effective new 5.1 surround sound mix, which did not require the recording of new music/effects tracks like the blasphemous 1990s “restoration” of Vertigo. Bottom line: this version is the best that Alfred Hitchcock’s most disturbing film has ever looked and sounded on home video and is an essential addition to any serious movie library. More here. Jolly am I made by what I consider the greatest of all heist pictures, a crime subgenre of which I am quite fond! 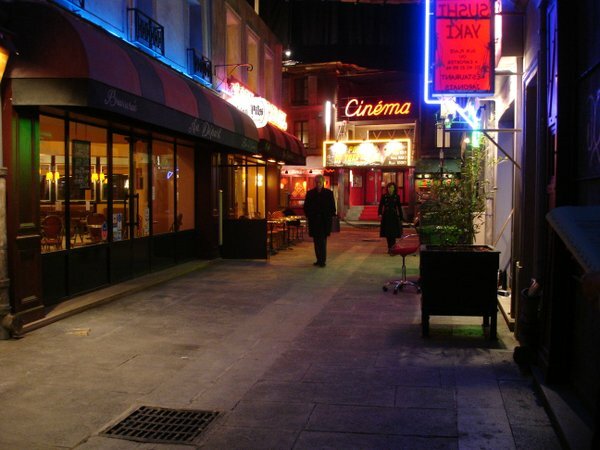 Studio Canal deserves kudos for being the first to marry Jean-Pierre Melville, the undisputed king of French film noir, with the Blu-ray format. 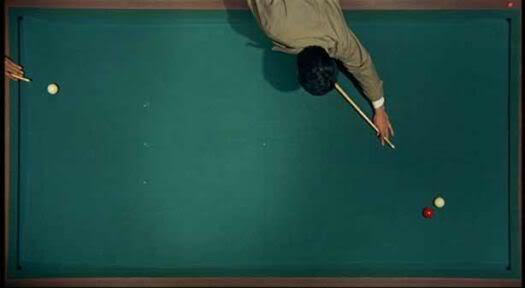 The end result is a thing of beauty, more than making up for their botched job of Godard’s Le Mepris from last year. Now bring on the Criterion Army of Shadows. Full review here. Warner Brothers has consistently bested the other Hollywood studios when it comes to putting out lovingly restored, high-quality Blu-ray discs of their “catalogue titles.” For me, their best 2010 offering was this new high-def transfer of Ron Haver’s 1983 labor-of-love restoration of George Cukor’s epic musical/melodrama. 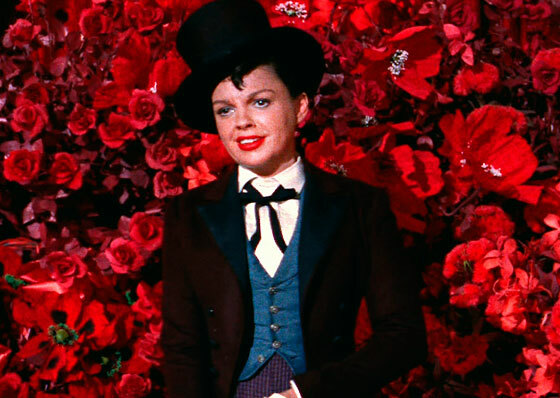 Judy Garland’s force of nature performance as rising star Vicki Lester has caused many to regard this as the greatest “one woman show” in film history but I think it’s James Mason’s quietly devastating performance as fading movie star Norman Maine that gives A Star is Born its soul. The Blu-ray format is particularly well-suited to Cukor’s mise-en-scene, which alternates between brilliantly vibrant Technicolor sequences and unusually dark images with diffused shadows dominating. French distributor Gaumont made my dreams come true by releasing one of my favorite movies ever in a region-free edition with English subtitles. The image quality may not provide as eye-poppingly drastic of an upgrade over previous editions as did their immaculate restoration of Jean Renoir’s French Cancan (also available region-free with English subs). But A Man Escaped, an exciting prison escape drama made in Robert Bresson’s inimitable “essentialist” style, is simply the better movie and, indeed, one of the towering achievements of the film medium. Hopefully, the rest of his catalogue will soon follow. Full review here. The still-underrated Frank Borzage is the most romantic filmmaker of all time and Lucky Star from 1929 may be his finest hour: a luminous melodrama concerning the love that blossoms between a farm girl (the always superb Janet Gaynor) and a disabled WWI vet (a never better Charles Farrell). Incredibly, this was a “lost” film until a print turned up in the Netherlands in 1990. That print serves as the source for this transfer and appears to be in remarkably good shape — better than any prints Fox had in their vaults of Borzage’s other silents. Strange that a Hollywood masterpiece like this would only be available on Blu-ray from a distributor in France, but this is an essential purchase for lovers of silent film. Fritz Lang’s sci-fi masterpiece looks more prescient than ever in this “complete” cut, in which 25 minutes have been restored for the first time since the film’s 1927 premiere. The missing footage was long considered one of cinema’s holy grails (alongside the missing footage from Greed and The Magnificent Ambersons), so this release is cause for celebration. Kino’s Blu-ray is perfect. More here. 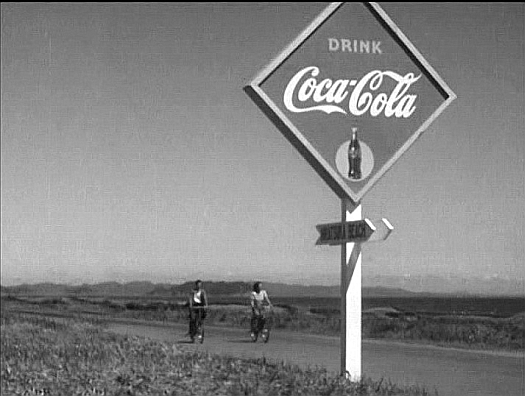 Last summer, the British Film Institute did the world of cinephilia a massive favor by releasing four of Yasujiro Ozu’s best films on Blu-ray (with more on the way in 2011). Two of his most sublime domestic dramas about intergenerational family conflict, The Only Son from 1936 and Late Spring from 1949, appeared on a single disc, automatically vaulting it to the top of my list of the year’s best releases. This is how all high-definition transfers should look — as faithful as possible to the experience of seeing the films as they would look projected in a theater, including whatever damage is inherent to the original film elements. Very film-like and very beautiful. Full review here. 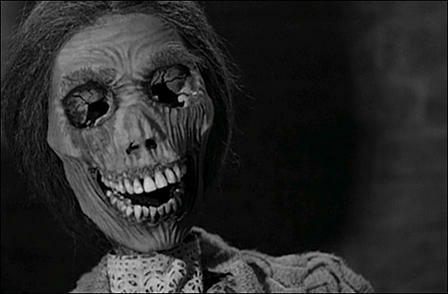 If this had been a Blu-ray release, it would have unquestionably been number one on my list. But since good transfers of Roberto Rossellini’s monumental World War II trilogy have never truly existed on home video in any format, I can only be grateful to Criterion for the hard work that must have gone into restoring these films and presenting them on standard DVD in the impressive shape in which they appear here. (Paisan in particular seems to have been rescued from oblivion.) 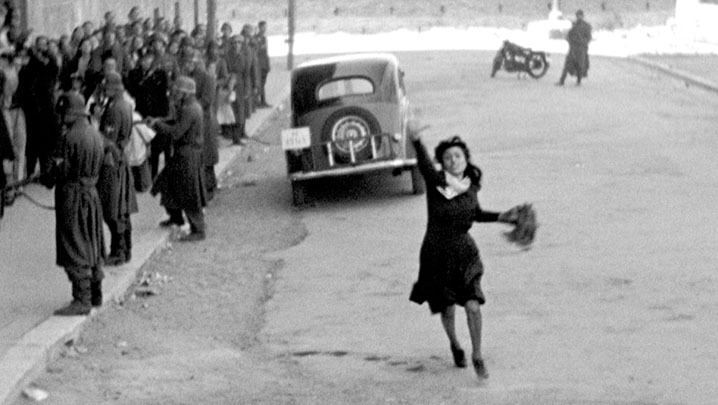 The movies themselves are definitive neo-realism, using a mix of professional and non-professional actors, location shooting with studio sets, and relaying ambiguous, loosely constructed narratives concerning the Italian resistance to the German occupation (Rome Open City) and the aftermath of the war in both Italy (Paisan) and Germany (Germany Year Zero). But it’s the copious supplemental material, including feature-length documentaries, interviews with Rossellini and an enlightening “visual essay” by Tag Gallagher, that pushes this to the front ranks of Criterion’s most important releases ever. F.W. Murnau’s romantic masterpiece, without which Terence Malick’s Days of Heaven would be unthinkable, finally gets the treatment it deserves from the good folks at Eureka’s Masters of Cinema label. The story is the flip-side of Sunrise, where the good-hearted title character from Chicago moves with her new husband to a Minnesota farm only to find her existence made a living hell by her live-in father-in-law. This contains some of the most visually ecstatic and transcendental moments in all of cinema, such as the swooping, swooning camera movement that follows Charles Farrell and Mary Duncan as they run through a wheat field before collapsing to the ground in newlywed bliss. The image quality of this Blu-ray is so clean and so pristine that it sets the bar impossibly high for all future HD transfers of silent-era films. 15. Breathless (Godard, Criterion Blu-ray) Full review here. I was saddened and dismayed to learn today of the sentencing of directors Jafar Panahi and Mohammad Rasoulof to six years in prison for planning to make a documentary film that would have allegedly incited protests against the Iranian government. 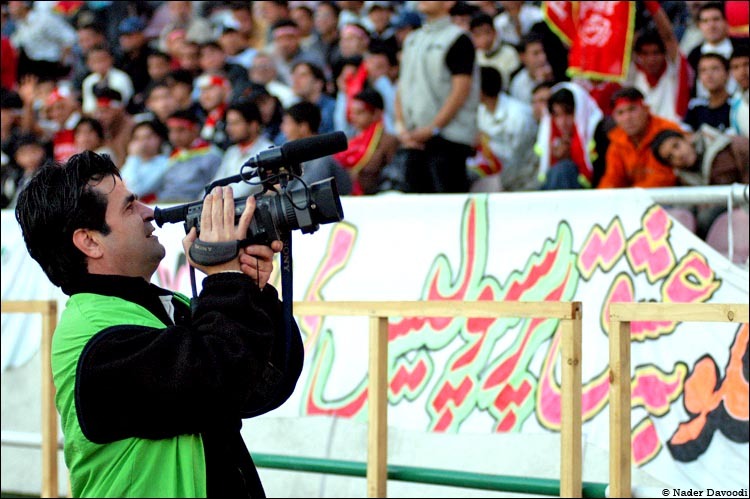 Panahi made two of my favorite films of the past decade: The Circle (2000), a tough, feminist drama about a pregnant woman seeking an illegal abortion in a nameless Iranian city and Offside (2006), a wonderful comedy about female football fans dressing up as men in order to attend a live match at Tehran’s Azadi stadium. 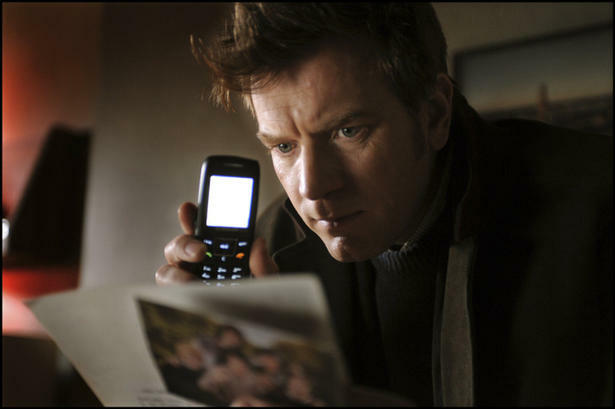 I cited both of them in one of the earliest posts I wrote at this blog: My Top 100 Films of the Decade. If you admire Iranian cinema or are concerned about human rights in general, I strongly urge you to attend the Facets screening. If you cannot make it, please at least sign this online petition calling for the release of two filmmakers whose only crime was to begin pre-production on a movie: Panahi Petition. Iran has a surprisingly long and rich cinematic history. I will try and post more about it early next year. Today’s post, in which I bestow a “filmmaker of the year” honor, is the first of three offering a highly personal round-up of the year in movies. It will be followed in the next two weeks by posts relating my ten favorite home video releases of 2010 and my ten favorite theatrically released movies of 2010. So stay tuned . . .
During the past calendar year, the single filmmaker whose work inspired me the most was not Abbas Kiarostami, Apichatpong Weerasethakul nor David Fincher, even though that esteemed trio was collectively responsible for directing the three best new films I saw in 2010. Instead, I’d like to bestow my first annual White City Cinema Filmmaker of the Year honor on a man who was born 120 years ago this month, died in 1975 and directed his last film in 1960. A pioneer of the German Expressionist movement who became a master of American film noir. A director of stunningly composed geometric images whose dispassionate view of the individual’s relationship to society made him, along with Shohei Imamura, cinema’s greatest entomologist. A man who habitually wore a monocle (but only for dramatic effect), told self-mythologizing tall tales about his filmmaking career in Weimar-era Berlin, had a reputation for being sadistic to actors, and included a shot of his own hands in every single one of his films. 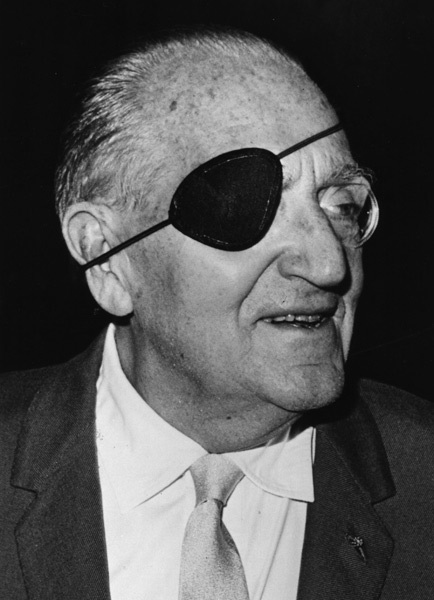 Of course I mean Fritz Lang. Like all great film artists, Lang’s best work continues to look better over time and has remained relevant to generations of cinephiles in ways that Lang himself probably never could have anticipated. 2010 saw yet another restoration/re-release of Lang’s seminal Metropolis, one of the most famous of all science fiction movies, albeit in a new cut that restored the film to something closely approximating its original length for the first time since its 1927 premiere. (Now missing only about 5 minutes of footage, this is likely the most complete the film will ever be.) After a successful theatrical run, especially for a silent film, the “complete” Metropolis was released as a perfect Blu-ray disc by Kino in November. Additionally, 2010 saw the Criterion Collection release M, Lang’s first sound film and arguably the greatest German movie of all time, in a spiffy new Blu-ray edition that easily superseded all previous home video releases. If that weren’t enough, Lang’s Moonfleet from 1955, highly regarded in auteurist circles, received its U.S. DVD debut courtesy of the Warner Archives label and his final Hollywood film, the superb noir While the City Sleeps from 1956, received its world DVD debut from the UK label Exposure. (I didn’t buy these last two however; I’ve got to eat too, for God’s sake!) Revisiting Metropolis and M, arguably the twin peaks of Lang’s career, in their newest incarnations, was simply the most fun I had at the movies this year. For me, 2010 was truly the year of the Fritz. The story of the many lives of Metropolis is by now familiar; after its disappointing German premiere, the film was drastically cut by UFA, the studio that had allowed Lang to realize his ambitious and expensive folly. Metropolis has seemingly been in a state of perpetual “restoration” ever since, including a misguided 1984 version supervised by composer Giorgio Moroder that featured an incongruous pop music soundtrack, and a much-ballyhooed 2001 “re-construction” that was thought to be definitive. Then, in 2008, a 16mm print of Metropolis was found in an archive in Buenos Aires that ran almost 30 minutes longer than any previously known version. This print, in admittedly poor condition and in a different aspect ratio than the original film, was sent to Berlin where the F.W. 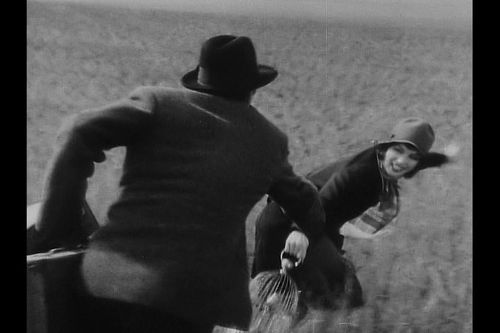 Murnau Foundation (the film’s official rights holder) performed a digital clean-up of the “missing scenes” and integrated them into the 2001 restoration. This Metropolis was given a rapturously received re-premiere at the Berlin International Film Festival in February and the rest, as they say, is history. The aspect of Metropolis that seems most prescient today may be its depiction of class warfare; the futuristic city of the title is only able to function because of a slave-labor system that keeps the working class confined to a world that is literally underground. 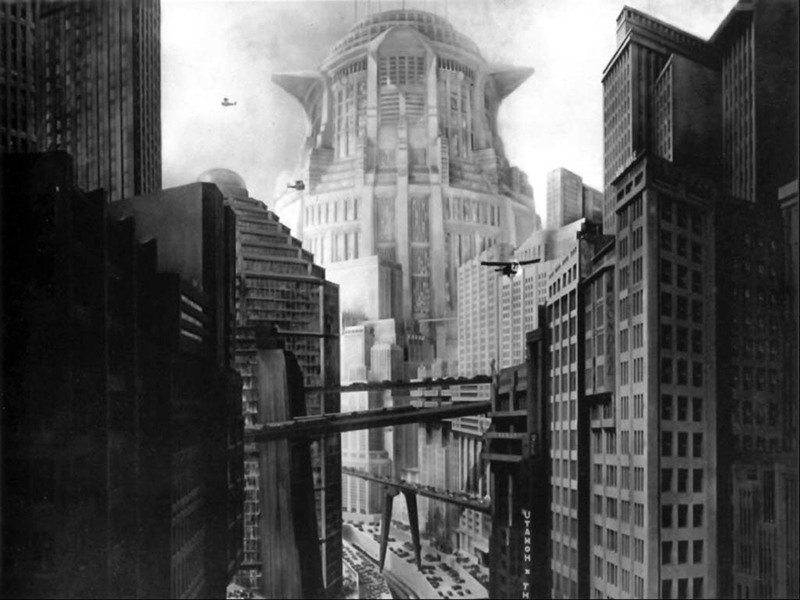 While many other sci-fi movies have since come and gone that look dated in their attempts at allegorizing contemporary issues (the now long-gone Cold War, for instance), I think Metropolis still looks an awful lot like the world we’re living in. Specifically, it looks like Dubai. Lang brings this futuristic world to life through a pioneering use of special effects, all of which still have the ability to impress and charm (and which clearly exerted an influence on everything from Dr. Strangelove to Star Wars to Blade Runner to The Fifth Element to even the sci-fi sections of Wong Kar-Wai’s 2046). However, the most impressive “effect” in Metropolis for me remains the performance of nineteen year old Brigitte Helm, who positively dazzles as the wholesome and beautiful workers’ advocate Maria as well as the sensual, evil robot designed in her image. Eighty three years after the film’s premiere, it remains a real pleasure to watch Helm act the hell out of this dual role. The symmetry that’s brought into focus with the restored footage is Lang’s doppelganger motif, which previously encompassed the divide between underground/above ground, workers/bourgeoisie and human Maria/robot Maria. The new restoration fully fleshes out Lang’s schema so that similar doublings occur between the film’s other major characters: Georgy 11811, a member of the slave-like proletariat trades places with Freder, the aristocratic son of Fredersen, Metropolis’ autocratic ruler. Georgy 11811 explores Metropolis’ seamier side (such as the delightfully decadent Yoshiwara club where the robot Maria performs an outrageous production number designed to inspire impure thoughts); for his part, Freder discovers the hard way, through monotonous, back-breaking labor, what exactly makes his father’s city run. But the most crucial doubling seen in the restored footage is one of the most fleeting sequences: Fredersen and Dr. Rotwang, the mad scientist who creates the robot Maria, commiserate at the foot of a monument to Hel, the woman whom both men loved and lost. 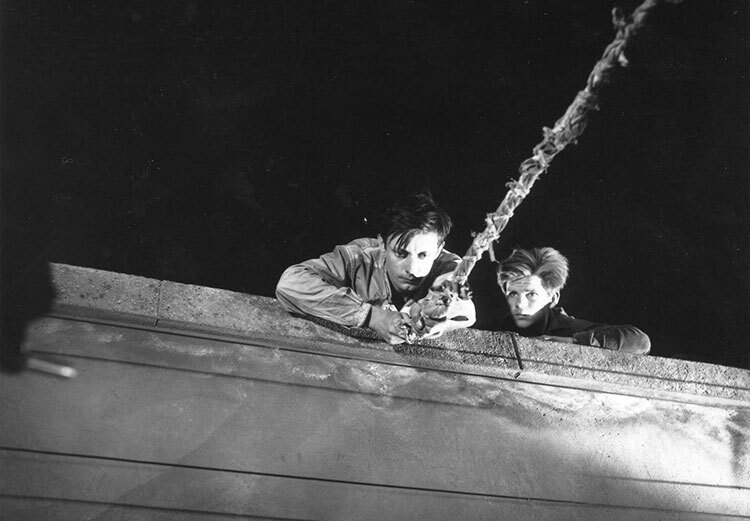 The doppelganger motif, a favorite device of German Expressionism in general and Lang in particular, also rears its head in M. Thanks to Criterion’s Blu-ray, the dichotomy drawn by Lang between the police and the criminal underworld in 1931 Berlin is thrown into sharper relief than ever before. But where Metropolis comes much closer to “pure” Expressionism, M mixes Expressionist techniques with elements of the police procedural and the serial killer thriller (both of which it can be seen as having written the playbook on) in a way that anticipates film noir; suspense is built not only through the film’s plotting but through the tension that arises between its stylized, abstract qualities (high contrast lighting, overhead angles, recurring images of a spiral) and its more conventional narrative elements. What was ultimately being “expressed” in the German Expressionism movement were the innermost thoughts and feelings of a film’s characters, which Expressionist filmmakers attempted to externalize through a distorted and exaggerated mise-en-scene. 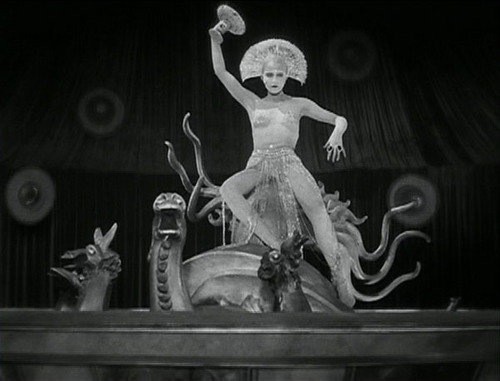 Sci-fi, fantasy and horror were popular Expressionist genres precisely because they were the most conducive to extreme stylization of cinematography, lighting and set design. 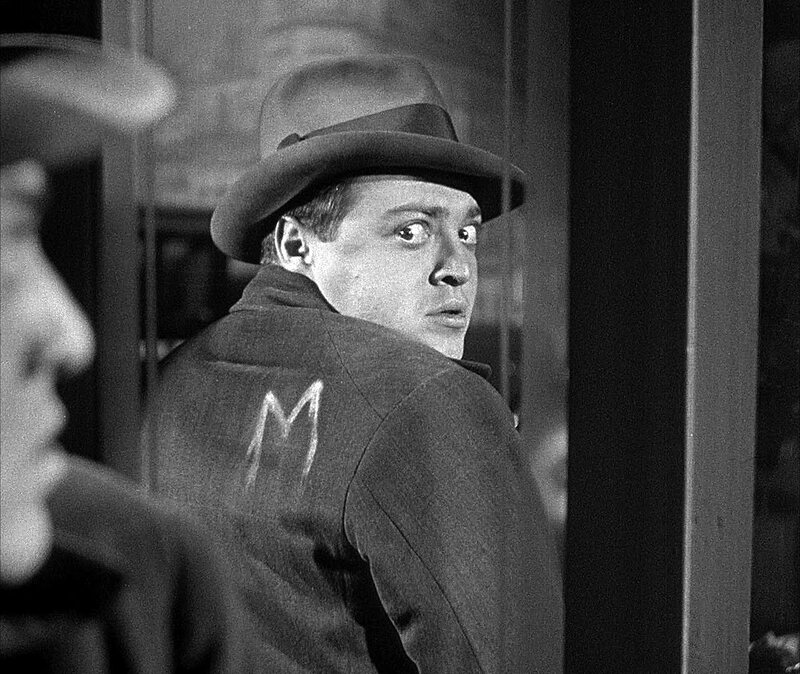 When M was released, the Expressionist movement was effectively over and yet stylistic traces remain; the film’s Expressionist qualities mainly concern the subjective experiences of Hans Beckert (the serial killer expertly played by bug-eyed Peter Lorre) as he stalks the streets of Berlin, but they co-exist with narrative qualities that occasionally achieve a documentary-like realism: the film begins with the sound of a gong like that heard before radio news reports in Germany at the time. 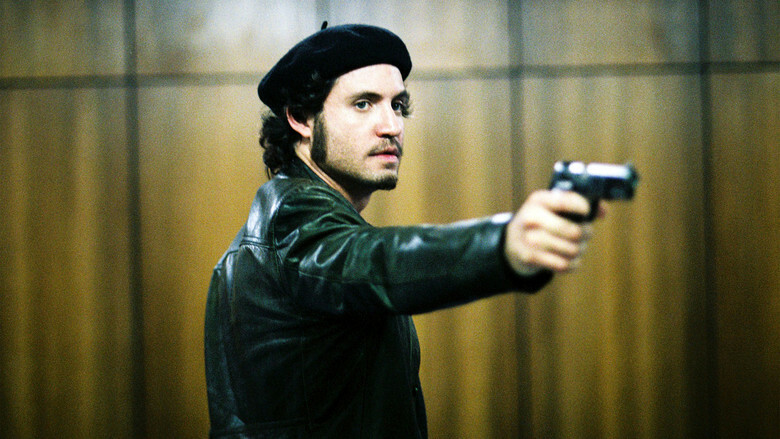 Many of the scenes involving both the police and criminal underworlds contain “inventory shots,” in which Lang’s camera objectively surveys the tools of the trade of each group. Some early montage scenes, in which we see a police dragnet widening day-by-day as the search for the heinous child killer expands, come across like something out of a police training film. My favorite aspect of M though is the film’s innovative sound design, which is saying a lot given Lang’s visual mastery. In 1931, Hollywood films had taken a huge step backwards in terms of visual sophistication due to the difficulties of early sound recording. Additionally, even the best Hollywood directors of the time were frequently saddled with “dialogue directors” brought in from the world of theater by untrusting studio executives. 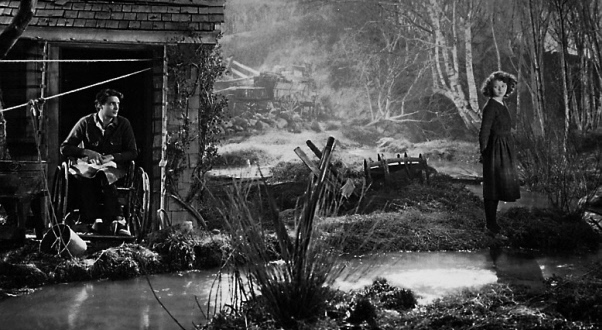 As a result, most American films of the early sound era look static, theatrical and uncinematic. 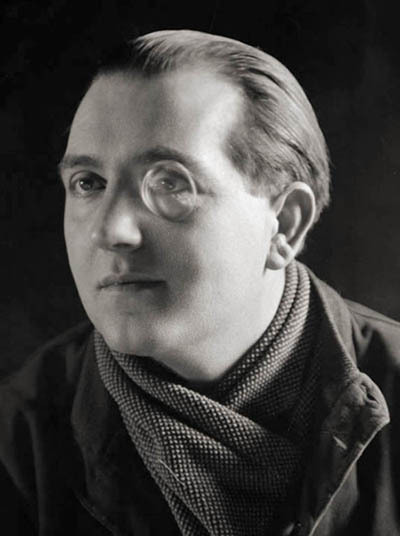 Fritz Lang, on the other hand, saw creative possibilities for the use of sound while simultaneously refusing to allow his camerawork to suffer. 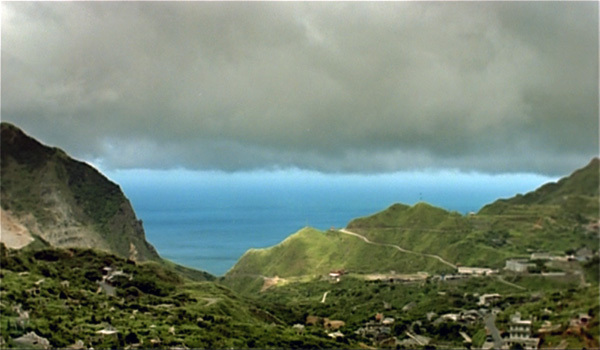 Instead, sound and image work together in M in a kind of relay; indeed, it was the first film in which the sound of a character’s voice from one scene was carried over into another scene set in a different location. Intercutting between two groups of people in two different locations (the police and the criminals), Lang reinforces the parallel between them by having them seemingly finish each other’s sentences. At other times, Lang shuts the soundtrack off entirely to convey a feeling of eerie quiet. And, finally, there is the absence of a traditional musical score. Instead, the only music heard in the film is Beckert’s whistling of “In the Hall of the Mountain King,” which allows the audience to identify the killer even when he is not onscreen. One of the welcome supplements on Criterion’s M Blu-ray is M le maudit, a short film tribute/remake by the late, great Claude Chabrol. This is fitting as no other director in the history of cinema proved to be as astute a student of Lang as did Chabrol. However, as masterful as Chabrol at his best could undoubtedly be, even this tribute underscores the idea that Lang is a cinematic giant precisely because he did it all first. 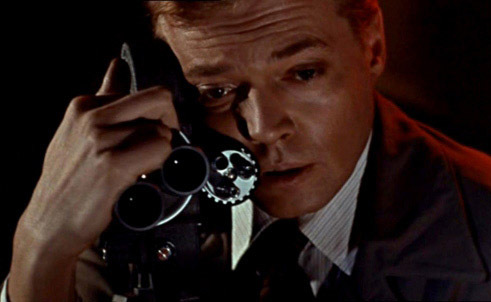 Lang’s best movies deserve to be re-discovered by each new generation of film buffs, as Metropolis and M continually have been, whether by theatrical revival or in new transfers on the latest home video technology. And if that final missing five minutes of Metropolis ever does turn up, I’ll be first in line to see it again. Robert Bresson’s Notes on the Cinematographer has to be one of the most interesting books ever written by a major film director. Modeled on the Pensees of his hero Blaise Pascal, the deceptively modest Notes compiles several decades worth of observations on the cinema and shows the same taste for minimalism, laconic wit and profundity that Bresson brings to his visual style as a filmmaker. Bresson’s “notes” range from cryptic sentence fragments (“The ejaculatory force of the eye”) to commonsense aesthetic advice directed to himself (“Replace an image with a sound whenever possible”) to more eloquent ruminations on the nature of the medium (one of the lengthiest examples is: “My movie is born first in my head, dies on paper; is resuscitated by the living persons and real objects I use, which are killed on film but, placed in a certain order and projected on to a screen, come to life again like flowers in water”). Early in 1998, I read an issue of the British film magazine Sight & Sound in which the then-96 year old Bresson had responded to several questions in a survey they had sent out to various filmmakers, critics and historians. Although I knew Bresson was still alive, it had been 15 years since his last movie (the masterpiece L’argent, which he completed at the ripe old age of 81) and he had kept such a low profile in the years since that I naively assumed he was probably no longer in possession of his mental faculties. His responses to the survey however were sharp, humorous and unmistakably Bressonian. After coming across a mailing address for him in an encyclopedia, The International Dictionary of Films and Filmmakers, I decided to write him a letter and tell him what his movies meant to me. The letter was handwritten and I didn’t make a copy but I remember writing that I had been blown away by a screening of his film The Devil Probably that I had attended at Facets Cinematheque several years before and that I couldn’t believe a filmmaker working in the 1970s on the opposite side of the Atlantic had made a film that seemed to so accurately describe the world I was currently living in. I also wrote that of all the works of art I had encountered only the novels of Dostoevsky had had a comparable spiritually uplifting effect on me. Of course, I never expected to hear back from him; I thought it would just be a nice gesture to tell him I loved his movies. Flash-forward to a year and a half later: in May of 1999, a complete Robert Bresson retrospective was opening at the Film Center of the Art Institute of Chicago (before it moved to its current location and changed its name to the Gene Siskel Film Center): all of the master’s movies in new 35mm prints! I planned on attending all of the films at least once and I was especially excited to see, for the first time ever, long-unavailable, never-released-on-video titles like Au Hasard, Batlthazar and Four Nights of a Dreamer. Less than eight months after I received his package, Bresson died of natural causes at the age of 98. Each semester in my Intro to Film class, I typically show either Pickpocket or A Man Escaped and lecture on Bresson’s innovative use of sound design. I tell my students the story of receiving my personally inscribed copy of Notes on the Cinematographer and describe it as my most prized film-related possession. I’m fond of telling them I love the book so much that if my apartment were to ever catch fire, I would throw it out the window and let myself burn.